We at Birkirkara Badminton Club are proud to announce that the application under the Erasmus+ Sport Programme (Small Collaborative Partnerships) has been selected for EU co-funding by the Education, Audiovisual and Culture Executive Agency (EACEA). 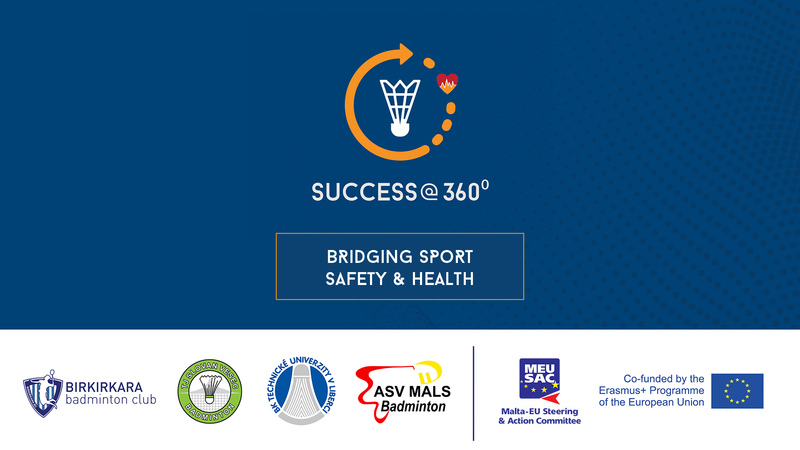 The project, Success@360° – Bridging Sport, Safety and Health, will have a duration of 18 months, and will be led by Birkirkara Badminton Club (Malta) having as associated partners ASV Mals Badminton (Italy), BK TU v Liberci, z.s. (Czech Republic) and TJ Slovan Vesec, z.s. (Czech Republic). This project having 4 transnational project meetings (2 in Italy, 1 in Czech Republic and 1 in Malta) together with Local Community Activities (Italy, Czech Republic and Malta) and a Final Project Conference in Malta, focuses on a number of activities that shall seek to increase awareness and exchange knowledge on how to protect athletes, especially the youngest, from health and safety hazards by improving training and competition conditions. This project fits in line with the main objectives of the Erasmus+ Small Collaborative Partnerships since it will seek to explore tailor made solutions for our clubs using the guidelines included in the EU Dual Careers Guidelines on the safety and welfare of athletes as a backdrop and reference point during our meetings, discussions and knowledge sharing activities. This project will adopt a two pronged approach. The first approach is to focus on the organisational level by ensuring adequate reflection, discussion and sharing of ideas amongst the participating organisations on the various aspects of health and safety, risk prevention and promotion of hazard-free environment both at the training and competition level. It will unite the partners involved in this sport to exchange best practices between countries and institutions, to improve conditions for athletes and promote synergies between sport, health, education and training and improve training and competitive conditions which are ultimately to the benefit of our members. The second approach will focus and include directly the participation of athletes, stakeholders, school children, parents/guardians and policy makers. This will make sure that the project tackles this thematic area from a multi disciplinary perspective and can result in tangible and concrete results which may be sustained over time. Birkirkara Badminton Club registers another first within the local badminton community. In addition to this, the Club reaffirms its commitment to help its athletes further develop their game.